Salvation And Survival: Beware Of The Fear Of Deception! Beware Of The Fear Of Deception! If I had to name one thing that keeps today's Christians from receiving more of God's revelation for this time, it would be the fear of deception. It's as if the Church is stuck on what Jesus had to say in Matthew 24:11, Many false prophets will arise and will mislead many. It's as if any unfamiliar idea or new revelation is met with automatic skepticism because it might be a lie from Satan. I agree that we must be discerning about what is taught or spoken when introduced to new concepts in the Bible, or to a different theology. But if we are good Bereans, as Paul instructs us to be, then we would be "receiving the word with all readiness of mind, and searching the Scriptures daily, [to determine] whether those things be so" (Acts 17:11). If we do this, then the chances of being deceived are actually quite small. We might have differences of opinion, but we could agree on the possibility of Scriptural veracity and various viewpoints. But here's what usually happens ... the two aspects of Paul's exhortation are not met. First, there is no "readiness of mind", which means having an open mind; being willing and eager to consider new ideas. Secondly, that readiness needs to extend to being willing to actually search the Bible to see if the new idea can be supported by Scripture. If it cannot, then it is easily repudiated and declared false. But oftentimes, Christians are so afraid of being deceived by the devil (or false teachings) that they cling to their religious traditions, which if thoroughly examined, often turn out to be traditions of men. I'm often left wondering just how many Christians actually know or read their Bibles?!? Christians are so afraid of receiving misinformation that they have a knee-jerk reaction of being offended when presented with anything that is outside their familiar theological boundaries. Subjects like Signs and Wonders for this age; or considering the Hebrew roots of our faith; or the existence of demons and spiritual warfare are condemned as un-Biblical and unauthorized subjects/teachings in many Church buildings. But where is the sense of the mystery of the Bible and the desire to seek a spirit of wisdom and of revelation in the knowledge of God? The minute that I think I can't learn anything new about Him, then I know my walk of faith has been stunted. I honestly believe that sometimes our spirits can detect a new revelation before our minds are able to catch up. Haven't you ever felt a rush or a quickening when reading a familiar verse, and you know that you are on the verge of a breakthrough to new understanding? After all, it is the Holy Spirit within us who is communicating with our spirit, which, I believe, is ready to receive great things from God. But if I let my mind filter out everything that wasn't on familiar ground, and reject it without Scriptural verification, then I'm just being religious. And isn't that what the Pharisees did when they rejected Jesus? Remember, the Bible tells us to renew our minds, not keep them under lock and key to religious traditions. It makes sense that only what I don't understand, but am willing and eager to investigate, is positioned to renew my mind. If we could train ourselves to actually seek the voice and presence of the Lord, we would stop being so paranoid about being deceived by the things we can’t explain. Sadly, it has been my experience that those who use their natural mind to protect themselves from deception are the most vulnerable to being deceived. They choose to rely on their own understanding and reason to keep them safe from false teachings, which is in itself a deception. (Remember that Proverbs 3 tells us to trust in the Lord and not lean on our own understanding). Instead, they warn about the dangers of new revelations, cling to their traditional explanations, and criticize those who long for more. But here's what we all need to comprehend ... the Holy Spirit counsels our hearts, which can grasp things our minds cannot. It is what rises up out of our hearts that influences our minds. True Faith does not come from our understanding. It comes from the heart. We do not believe because we understand; we understand because we believe. And those Christians who have a heart to seek a greater understanding of God should not be forced to bring the level of their Biblical understanding down to accommodate those unwilling to go beyond their comfort zone. And we must not forget that we are called to mature and grow in our faith and understanding -- God wants us to move from spiritual milk to solid foods and the meat of His Gospel message! Proverbs 25:2 is fast becoming my new favorite Bible verse: It is the glory of God to conceal a matter, but the glory of kings is to search out a matter. People, our God sees us as kings and priests! And our "royal-ness" never shines brighter than when we pursue hidden things with the confidence that we have legal access to search for them. The mysteries of God are our inheritance! 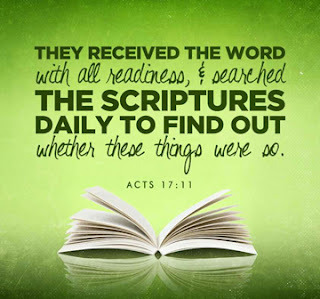 And the Body of Christ is enriched when one of us can share some new Scriptural treasure that God has revealed to us. After all, I hope we aren't so arrogant as to think that there is nothing new to learn from Scripture, or that we know all there is to know about God. So let's not deny those among the Body who are eager to discover new Truths in the Bible. Disagree, in love, if you must. But do not put a limit on the Glory of God or His revelations. Colossians 2:2 "... that they may be encouraged in heart, knit together in love, and filled with the full riches of complete understanding, so that they may know the mystery of God, namely Christ..."
Wow. Great article! We follow a principle with the engineering work I do--never fight the data! It always points you in the right direction when you're trying to discover the ground truth on a problem. The same applies to God's word. Never fight God's word! I can't tell you how many times I stood in one position because of what man taught me only to be overwhelmingly forced into another position by God's word. Thank you! It always makes me sad when Christians try to stifle the new revelations that God is bringing to others. The Word is the means by which God reveals Himself, and enlarges our view of His Nature and Character. There is more to know about Him than just what the Word tells us... to try and keep someone else from gaining a new level of relationship and understanding of God smacks of selfishness and a religious spirit! Pam, Thanks for the encouragement! You bet! If you are pursuing God and haven't been in this position yet.... you eventually will be. We all need encouragement! I know one thing I had to work my head through, back 16 years ago when the Lord led me to Hebrew Roots and to question so much of what I thought I "knew" concerning holidays, the Sabbath, and traditional Christianity, was "why me"??? Why, out of billions of people on this planet, did I discover this, when so many people who knew the Scriptures so much better than I, over thousands of years, did not. I really struggled to understand how they could all be wrong, and I could be right. I wrestled with the whole "deception" concept for a really long time. Why would God choose me to reveal these things to? Could they really be true? Or was I totally in error? It took me a long time to finally accept it with all my heart and let go of the fear I had been deceived. He showed me that people who find new truths usually start alone...during the Reformation, they were doing the same thing...they were mostly alone...and they believed it so much they were willing to die for it! Their very lives were at stake to find these new truths, believe them and then teach them. That helped a lot. I still don't have a totally acceptable answer to the "why me"...it seems that I am now constantly learning new things and changing long held beliefs...but it doesn't bother me so much anymore. It's exciting to be on this road...my walk with God barely resembles what it was before...there is so much that has been hidden that I can now see...I have little in common with the people I shared my faith with for most of my life...and I wouldn't change it for the world! I now search the Scriptures and it's right there in front of me, in black and white, and I marvel that I didn't see it before...and why people can't see it now! What is your answer to that question, Pam? I'd love to know! Karla, I think all of us who are truly seeking to know more of our God struggle with exactly what you experienced. For me, it was a matter of continually returning to Scripture to see if these "new truths" could be verified in multiple places. And I also learned to discern who might be people that I could trust in asking their opinion -- people who have legitimate and demonstrated fruit in their lives. Finally, it just hit me square between the eyes … "He who has ears to hear, will hear". And 1 Corinthians 2:13, "And we impart this in words not taught by human wisdom but taught by the Spirit, interpreting spiritual truths to those who are spiritual". So, ultimately, it is up to each of us to "be spiritual"… to seek a spiritual relationship with our spiritual God who wants to reveal more of Himself to me. So, I believe that you, like me, and so many others, are forging our individual relationships and seeking more of our God and we have "ears to hear". Therefore, we are being taught by the Spirit, and receiving the truth directly from God. Keep on your path! Your walk with the Lord is SO pleasing to Him! So very true. We as a church seem to think that the enemy's power to deceive us is greater that Holy Spirit's ability to lead us. God is good, he is a good father. He will not give us stones when we ask for bread. He will lead us into truth because his word is truth. (Jn. 17) Gotta learn to search out the kingdom like a valuable coin or precious pearl! Blessings! When you use the Word that our God has given us, it is truly a light unto our path, isn't it? With His Light shining in us and through us, we don't need to fear deception… we just need to trust what He says! Thank you for always representing God in His fullness! Belle, This one should ring true for anyone trying to claw their way from organized,weak and mainstream christianity. Ive noticed that there is a very interesting paradigm that happens when someone wishes to push on the boundaries of the box. First those with common theological views will align quickly against those wanting to search out a matter. Secondly, those from that theological group will not only lose all aspects of "loving christianity" they will not stop until you are physically gone or removed! This is scary stuff because we are warned of brother turning against brother by Jesus himself. His reference is to the thing he's ushering in called "christianity". These so called believers acting as they do seem to me to be something other than christians. If it walks like persecution maybe its persecution! We've been conditioned for so long to look for persecution from outside the church that we aren't ready as believers when it comes calling from the nice soccer mom who's superficial and basic understanding of the scriptures is "enough" for her and should be all you need based on her theological views. In her and her friends little christian tribe your view is deception and eventual damnation! Got it! The frustating part is all this will end up in the Leaderships lap and their primary motivation will be to shut all the disharmony down as quickly as possible. Those with intentions of deep diving or digging in to really find out what kind of God this is we serve are always going to be a problem for the weaker doctrinally minded. Ive been wounded by leadership so many times that Im immune to their venom! Maybe thats what Jesus meant when he said "we will pick up serpents and no poison will harm us" I say we better start to thicken our skin with these smaller thinkers and hold our ground. Maybe defending the faith is more than meets the eye. Who would have thought we would need to contend for the faith against a tribe of believers? I for one am done being bullied by church believers who are scared of digging into a concept that is a bit beyond the seminary canned view!! I am constantly amazed at how well readers can express their own experiences that mirror mine. And your thoughts are so well-developed and discerning that you've given me an idea to use your words in a future blog... giving you credit, of course! Thank you for taking the time to share your insight and advice. It's well received! On the ride to work this morning, I told my neighbor about my experience over the last few days listening through the DHT training videos from Curry Blake (which I finished last night). I described wrestling through the subject of divine healing I grapple with every few years, and how "a friend" suggested I watch the videos. I described my willingness to rely on the Holy Spirit inside me to guide me through the subject and that I don't need to be afraid of the sacred coes you mentioned. He didn't have much to say except, "My dad is in that camp." Sometimes the Church's camps baffle me, but then I realize our fleshly nature to surround ourselves with other like-minded believers. They can be helpful as we learn to digest new milk, but crippling when we neglect a balanced diet. Like the previous commenter, you have hit upon a valuable lesson for us all! And it's as if you both have ESP because these are the exact thoughts that have been pricking my spirit lately. I can't say it any better than you have, and I will expound on your wise words in the next or so. Thank you!